Then the other week, I took a drive in another car that promised to help cut greenhouse gas emissions. The car itself was unremarkable — a Lexus RX hybrid that anyone with a spare $42,000 can buy. What was potentially revolutionary was the little black box sitting on the dashboard to the left of the steering wheel. The box had three lights and when the car’s driver makes a fuel-wasting or dangerous move, such as slamming on the brakes, making fast, sharp turns or weaving through traffic — the LEDs go from green to yellow to red. See, the problem, dear reader, isn’t just your carbon-spewing car, it’s you. “There are habits that people fall into that they get away with all the time and by making slight changes in those habits you crash a lot less often and you burn less fuel,” says Dan Steere, chief executive of GreenRoad, a Silicon Valley startup that installs that little black box and other technology in commercial vehicle fleets. GreenRoad is backed by Richard Branson’s Virgin Green Fund and Al Gore’s Generation investment firm. The road to a sustainable future, in other words, will be paved not just with shiny new gadgets that help cut fossil-fuel consumption, but also by new technology designed to change people’s planet-unfriendly behavior. 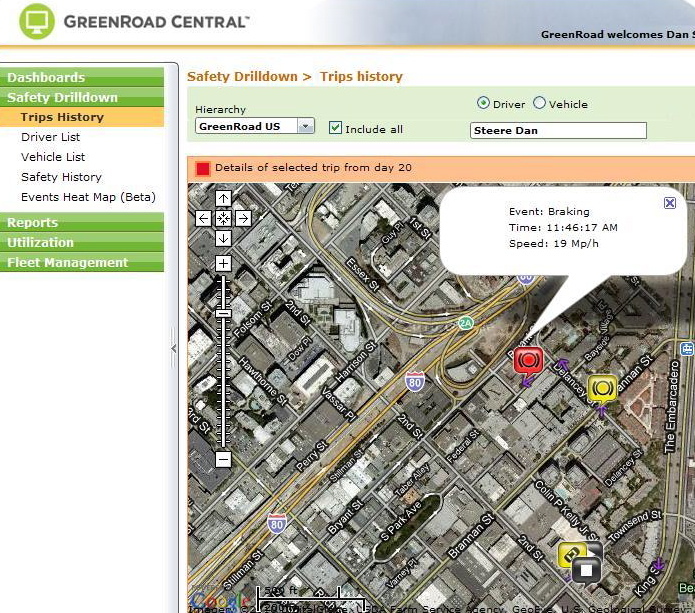 GreenRoad attempts to change drivers’ fuel-wasting ways by giving them constant feedback — the little black box — and by sending them weekly emails that analyze their driving and offer tips for improvements. The payoff for GreenRoad’s corporate customers, according to Steere, is fewer accidents and a lower bill at the pump, all without having to make capital investments in new vehicles.